Of 162 pledges for climate action (INDCs), 104 (in red) intend to make emission reductions in agriculture, and 127 (in blue) list agriculture as a priority for adaptation. An additional 15 countries have economy-wide mitigation targets. Countries were asked to submit pledges, called Intended Nationally Determined Contributions (INDCs), for climate action that they intend to take under a new international agreement discussed at the Conference of the Parties to the United Nations Framework Convention on Climate Change (UNFCCC) in Paris in 2015 (COP 21). As of April 28, 2016, 162 INDCs had been submitted, representing the contributions of 189 countries (the European Union submitted a single INDC representing all 28 member countries). These INDCs become NDCs and form the basis for implementation of the Paris Agreement, with revision every two years and expectation of increasing ambition of mitigation contributions. CCAFS reviewed the INDCs with an eye toward what they mean for agriculture: What countries included agriculture in their mitigation and adaptation plans? What practices did they prioritize for implementing those plans? How much financial support may be necessary for implementation? The Info Notes are based on data from November and December 2015. The dataset reflects INDC submissions through October 2016, and the maps reflect the October 2016 dataset. Download the full dataset and maps. This analysis and data is meant to inform national planning of mitigation and adaptation strategies. CCAFS may be able to assist developing countries in refining NDCs or planning implementation strategies. Please contact Julianna White for more information. In their INDCs, countries were asked to state their targets for mitigation of greenhouse gas emissions. 104 countries (in red) included agriculture as one of the sectors in which they intended to make emission reductions towards their targets; 70 of these are developing countries. The 15 countries in lighter red made economy-wide mitigation targets. Countries that mentioned additional actions or plans that they may undertake in the agriculture sector but did not officially include agriculture in their mitigation targets (e.g. Bangladesh) or did not include a GHG reduction target (e.g. Myanmar) were not counted among those that included agriculture in their mitigation target. For this reason, a few countries that show mitigation measures in the following maps are colored red in the mitigation targets map. Parties to the UNFCCC had the option of including priorities and plans for adaptation to climate change in their INDCs. Most Parties from developing countries (134 countries) did so, and 126 of those countries listed agriculture as a priority for adaptation. Belarus also mentioned agriculture as a priority sector for adaptation. All of these countries are shown in blue. Countries that did not include adaptation plans in their INDC or did not mention agriculture in their adaptation plans are shown in orange. Mentions of agriculture in introductory sections or comments on agricultural vulnerability to climate change were not counted among countries prioritizing agricultural adaptation if it was not followed up by mentioning agriculture in future adaptation plans. 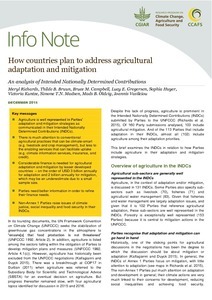 Some INDCs provided information on particular agricultural subsectors or activities that countries plan on prioritizing for mitigation or adaptation. Mention of common subsectors and activities is illustrated in the maps below. It should be noted that while some INDCs mentioned specific agricultural practices, few focused on the enabling services that can facilitate uptake or manage risk (e.g. climate information services, insurance, and credit). Countries that mentioned livestock (61 countries), manure (46 countries), or grasslands (50 countries) as priorities for mitigation are shown in red. Countries that mentioned the livestock sector as an adaptation priority (61 countries) are shown in blue. Countries that mentioned livestock-related mitigation and adaptation are in purple. A through review of livestock mitigation and adaptation is available from Tackling Climate Change through Livestock, Herrero et al. 2015 and Herrero et al. 2013. Countries that mentioned croplands (52 countries), fertilizer management (43), agricultural residues (40 countries), rice paddies (48 countries), or some combination of these categories as priorities for mitigation in their INDCs are shown in red. Countries that mentioned crop management or seed systems (57 countries) as priorities for adaptation are shown in blue. Countries that mentioned crop-related mitigation and adaptation are in purple. Examples of cropland mitigation and adaptation strategies include nitrogen efficiency, alternate wetting and drying in paddy rice, carbon sequestration, and conservation agriculture. Countries that mentioned agroforestry as a mitigation priority (23 countries) are shown in red. Those that mentioned agroforestry as an adaptation priority (29 countries) are shown in blue. Countries that mentioned agroforestry in the context of both mitigation and adaptation are in purple. See this special issue on mitigation and adaptation in agroforestry. 65 countries mentioned gender in their INDCs. 35 countries mentioned gender in relation to adaptation; and 18 mentioned gender in relation to mitigation. Several additional countries made a general mention of gender, though not in relation to adaptation or mitigation. 15 countries included gender in the context of agricultural mitigation or adaptation. A country was registered as including agriculture in its mitigation target if the INDC met the following criteria. Agriculture was included among the sectors prioritized under “scope and coverage” of the INDC, or the INDC described agricultural mitigation actions that would contribute toward the target. Countries that mentioned additional actions or plans that they might undertake in the agriculture sector but did not officially include agriculture in their mitigation target (e.g., Bangladesh) or did not include a GHG reduction target (e.g., Myanmar, Nepal) were not counted among those that included agriculture in their mitigation targets. 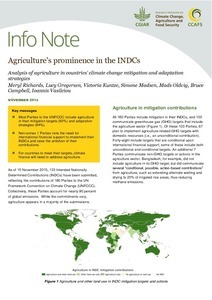 A country was registered as prioritizing agriculture for adaptation if the INDC mentioned agriculture within the adaptation section, or if it was obviously in the bounds of adaptation. Mentions of agriculture in introductory sections or comments on agricultural vulnerability to climate change were not counted if they were not followed by mentions of agriculture in future adaptation plans. We used the qualitative analysis software QDA Miner Lite (Provalis Research) to search for and categorize mentions of agricultural mitigation and adaptation measures within the INDCs. QDA Miner tags passages of context containing particular keywords, which we then examined in context to determine if the keyword described an adaptation or mitigation measure that the country planned to undertake. INDCs differed in how they described mitigation measures: some listed IPCC source/sink categories, while others described priority mitigation practices or themes of mitigation projects. For mitigation, 20 measures were included, corresponding roughly to the IPCC 2006 source/sink categories for agriculture, forestry and other land use, with some additional categories to capture further detail. Keywords were selected based on prior knowledge. Results from a selection of 25 INDCs were then double-checked by reading and additional keywords added to ensure that mitigation measures were adequately captured. INDCs in French and Spanish were analyzed using keywords translated into those languages. Because there are no established categories for adaptation measures, these were defined by the content of the INDCs themselves. We qualitatively analyzed approximately 25% of the INDCs and recorded measures that countries intended to take to increase agricultural resilience. Fourteen different adaptation measures and their associated key words were cited; these were then used to analyze all of the INDCs quantitatively. The categories of mitigation and adaptation measures and keywords used are listed in the initial information worksheet of the dataset. Data on finance requirements for agricultural mitigation and adaptation were collected through manual analysis of the text. The data collected for adaptation finance included: amount specified for climate change adaptation and amount for agricultural adaptation specifically. For mitigation finance, only the amount for agricultural mitigation was recorded. We recorded the time frame specified for finance needs and used this to estimate annual finance needs for agricultural mitigation and adaptation. Where only an end year was recorded (i.e. “up to 2030”), we assumed an initial year of 2016. Only mentions related to future funding were registered; any funding under delivery or which had already taken place was not included. Sources of climate funding mentioned in relation to the adaptation component of the INDC were also registered. In addition to CCAFS donors, the U.S. Agency for International Development (USAID) supported the publication of the data and maps on this page. The opinions expressed herein are those of the author(s) and do not necessarily reflect the views of USAID.